Happy New Year to all. It's the start of a new year which means a new bird list for most birders. Not me. 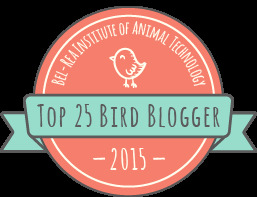 Chasing birds for a contest is soooo 2013. Patty and I ended in a tie at 357 birds each which is 57 birds more than either of us ever planned for. 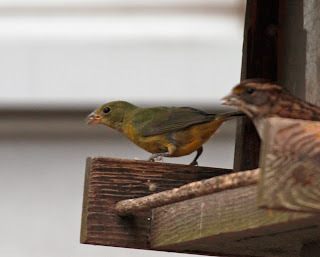 We ended the year strong by tallying 4 new birds in 2 days thanks to the Painted Bunting and Ash-throated Flycatcher that showed up in the nick of time. You already read about the other 2. I want to say thank you to everyone who helped and supported my Big Year. You know who you are. Some helped by providing information about birds, locations, etc. Some helped by accompanying me on the chase. Some helped by ignoring all of the chores that were left undone and time missed (Connie, that's you). I will do a Big Year recap soon. Here are a few photos from the last day. 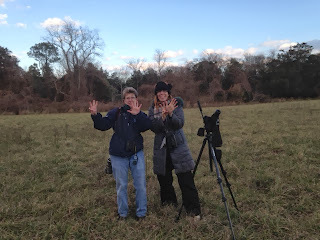 Patty and I thought we would end the year with a nice easy bird walk through Tinicum. Patty brought a friend along (Rachel) and I brought Di and Barbara along. 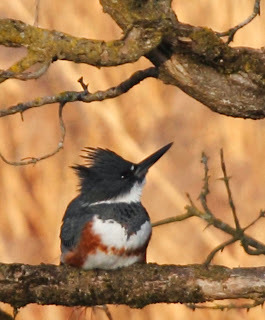 We had great views of this female Belted Kingfisher. She sat there in a stooper for a long time allowing us to get fairly close. And then the email came in - a Painted Bunting had been seen at a bird feeder in north Jersey. Patty protested but deep down inside she knew we had to go get that bird. Off we went. Poor Rachel ended up getting a ride home with Di and Barbara. Roxy went with them too, along with my Fiat. Patty and I hopped in her Prius and headed north on the NJ Turnpike (again). We almost ran out of gas (in a Prius?) but got to the house and saw the bird within 2 minutes. #356 - Check! Of course it didn't end there. While we were headed north on the turnpike, we got a text message about an Ash-throated Flycater in - guess where - Cape May. I don't even have to type the next sentence. You know what we did. We headed south on the Garden State Parkway and arrived in Cape May 2 hours later. Unfortunately, the flycatcher was not as accommodating as the bunting. We searched for over an hour with no luck. Luckily, Harvey showed up and spotted the bird just as we were heading back to the car to give up. Good ole Harvey saved the day! The bird popped into sight just long enough for us to get a good look through the scope but not long enough for a photo. #357 was in the bag! We raced back to Philly knowing that we were going to be late for our New Year's Eve plans with our partners but also knowing that we did the right thing by adding 2 more birds to the list. Patty and Steve headed to the riverfront for fireworks. Connie and I met Biggie and Janette for an early dinner in Jenkintown. Done! What will I do with all of this free time? You'll be the first to know. Congratulations! I am sure I speak for everyone who knows about this contest (which is, everyone in your life!) when I say that I am so proud of you and your amazing accomplishment. I hope you do the right thing and sleep in this weekend! Congrats, ladies, you rock! I kind of love that y'all worked so hard and came in side by side. So cool. Happy 2014!